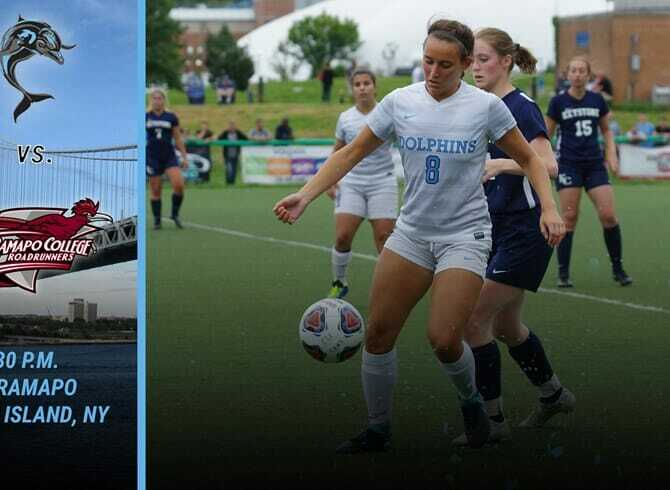 The College of Staten Island women’s soccer team recently took their first win of the season, and so did their opponents in Ramapo College. Today, the two sides will meet at 3:30pm at the CSI Soccer Complex looking to start a win streak on what promises to be a cloud-covered afternoon in Staten Island. Players to Watch (CSI): The Dolphins broke out offensively in their last game, and after scoring just a lone goal through 180 minutes to start the season, CSI registered six times in a win over Keystone. Samantha LaValle continued to lead the way offensively, as the sophomore registered her first CSI hat trick scoring three goals to improve her season total to four. She also leads the way with 17 shots fired. Next in line is senior Lauren Smith, who has eight shots, and is the only Dolphin to register a goal and an assist this season. Adrianna Parello, another CSI senior who spends a majority of time in the back while lending to the rush up front is the team leader with two helpers this season. Goalkeeper Kaila DiBenedetto has spent every minute between the sticks this season and registered her first shutout of the season on Saturday, the fifth of her short career. Players to Watch (RC): Despite being 1-3, Ramapo has played well offensively this season, spreading out 10 goals through their first four games. The balanced attack is led by Liliann Vizcaino, who is tied for the team lead with two goals but has a heavy five assists so far to go with a team best 13 shots. Jessica Raccioppi also has two goals with Skyler Rybacki, and both of them are next in line with 9 shots apiece. Look for players like Jaycee Sandberg, Claire Ciemiecki and Kaelyn Angelucci to clog up play in the middle and back for the Roadrunners. Goalkeeper Elizabeth Harvall has shared time but has started every game, leading the squad with 12 saves and a .545 save percentage. News & Notes: This afternoon marks the 10th meeting all time between these two teams and it has been a series dominated by Ramapo. The Roadrunners are 9-0 against the Dolphins, have a 3-0 record on Staten Island, and have outscored the Dolphins by a whopping, 49-3, in the series. The two teams have not met, however, in four years, and their last meeting on Staten Island came in 2012, a 5-0 Ramapo win. Both teams started their season on losing streaks but have followed up with a win. CSI started 0-2, being outscored, 9-1, before a big, 6-0, win over Keystone College on Saturday. Ramapo started their season 0-3, outscored 10-4 before beating Mount Saint Vincent College, 6-0. The two teams are a combined 0-5 away from home and 2-0 at home. Ramapo is on a 10-game losing streak on the road dating back to last season. They were just 1-7 on the road last season. The Dolphins are hoping that plays into their hands as they are a terrific 20-5-2 on their home field since 2015.